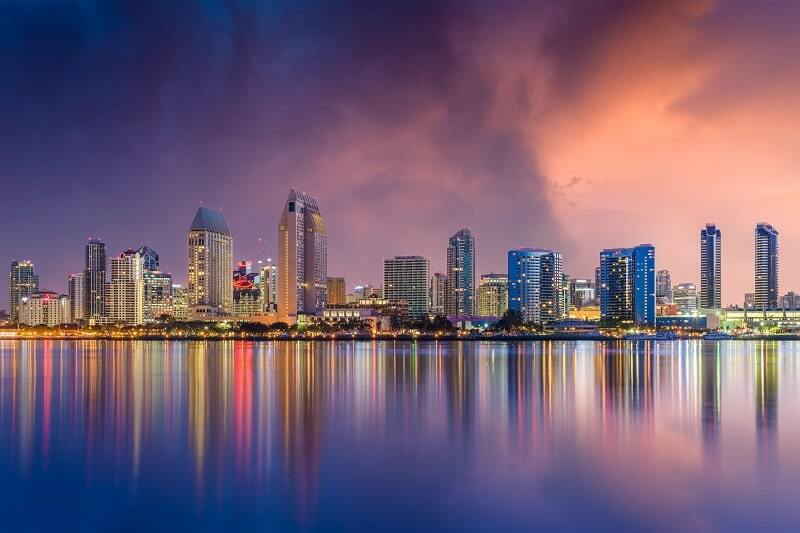 There are so many things to do in San Diego, there is no room for boredom, it is a city you fall in love in, with its beautiful architecture, paradisaical beaches, tourist sites, climate and people. It has many attractions and things to do so here’s a list of 12 things to do in San Diego. Staying by the Gaslamp Quarter in downtown San Diego is a great and budget friendly idea. It is 5 minutes from the airport and it is very accessible. In this area there is a wide variety of hotels to choose from, many of them boutique style with nice rooftop pools. The best and most convenient way to move around San Diego so that you explore it at your own pace and from any point of view, is by car. Renting a car in San Diego will give you the freedom necessary to make the best of this beautiful city. Public transport is also a good option to get to know the city in depth, although sometimes it is not the fastest way to get around San Diego, because of the transit of the city. Also it does allow you to know the beautiful city from all its points of view. A good option to move around San Diego is to take the tram or trolley, this transport covers almost the entire metropolitan area of ​​the city. It has 3 main lines, one that only operates some days of the week and another that opens only for events. There is also the option to move by bus through San Diego, there are several bus companies but sometimes it is a slow way of transport especially during peak hours, due to the traffic of the city. The cuisine in San Diego is very varied, but thanks to its location you will find the best fish and seafood. The best places to find them are from La Jolla, Coronado and the area along the bay to savor the delights of the sea while enjoying a magnificent view of the sea. Another must-see within San Diego’s gastronomy are craft beers with their varied and exclusive flavors. Gastronomy in this beautiful city, also receives Mexican influences for its proximity to the country. Thus so many of its dishes are complemented by Mexican flavors and dressings, giving a special touch to your meals. 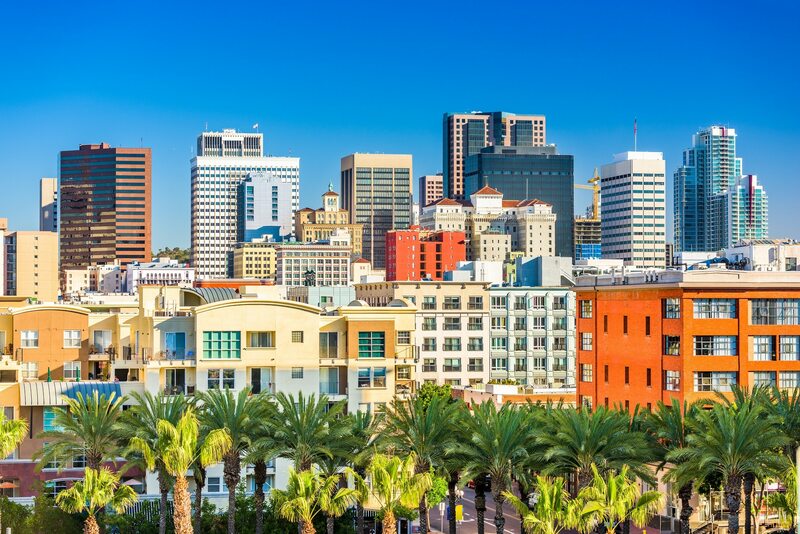 These and other delights can be found in the Gaslamp neighborhood, a must-see to visit during your stay in San Diego, not only for its historical value, but also because of its trends in terms of gastronomy, with a large amount of restaurants and bars for all tastes and budgets. 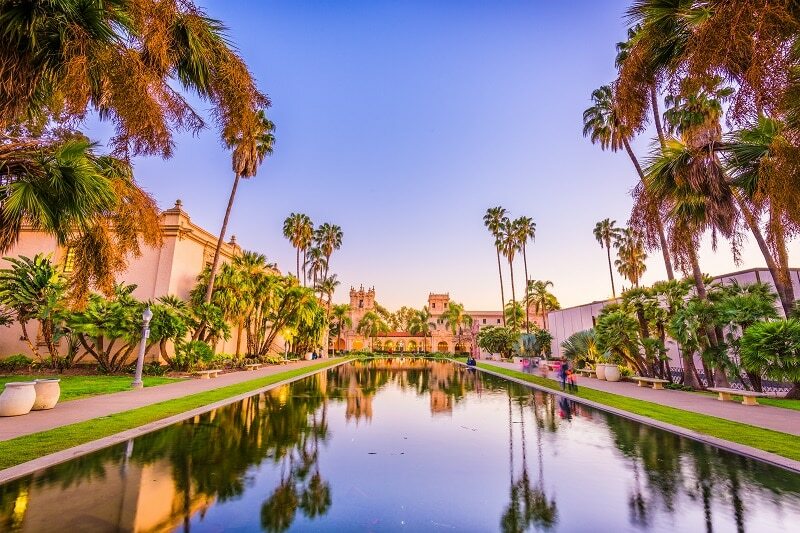 San Diego is known for its sunny weather and more than 30 beaches, which is why it is at the top of things to do in San Diego and also why it’s so important to have your own rental car, in order to move between them easily. From Coronado to Ocean Beach, passing through La Jolla Shores and Del Mar, there are more than 70 miles of coastline to explore. In most cases, it is relatively easy to find free parking, and if you have your own equipment, you can surf, snorkel, kayak or dive at any time. One of the favorites is Imperial Beach with the pier. Staying on the cliffs until you see the sunset in San Diego is an excellent plan as well, the scenery is mesmerizing. It is also an ideal place for picnics. Then you can try visiting the old town. Going to the old town is a plan that can not be missed when visiting San Diego, an area full of history. Meet the first courthouse and San Diego jail, visit the El Campo Santo cemetery and discover the historic Whaley House, built in 1885 and named the number one haunted house in the United States. Go to the Sheriff’s Museum, which is filled with interactive exhibits from the 150-year history of the Sheriff’s Department. Other interesting places to visit are the Mormon Battalion Museum, the Brick First Court, the Church of the Immaculate Conception and the Herrero Shop, all within a few blocks. As you may have noticed, there is a lot to do in San Diego. We encourage you to try this beautiful city as your next destination.